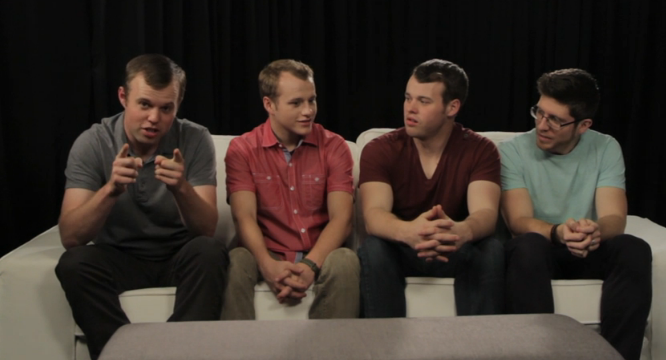 What are John-David Duggar's plans for the future? As the third oldest child of Jim Bob and Michelle Duggar, John hopes to tie the knot and raise up "a good, solid family." Does he have a gal in mind? Find out in the following video, which features a segment of TLCme host Danni Starr's interview with John, Joseph, Josiah, and Ben. I found really sad that JD kept saying "keep watching". Courtship & marriage is not something the world needs to "watch," and he should know that. He looked like he was joking around when he said that, so hopefully he really didn't mean it, but it makes you wonder. Me too! Is he wanting a family or material to continue the TV show. He just kept saying " I don't know--keep watching". It's awkward and uncomfortable. Do the Duggars ever read these posts? No, he was honest and said he hasn't found anyone yet. What he said was just fine. :) It's not like he was teasing us. TLC is no longer the Learning Channel and judging by the clips, it is evident in these so-called reality shows. It's painful to watch and I am surprised the Duggars continue to do business with a network that is so unconcerned about quality programming. They are evidently not concerned about painting the family in a favorable light, that's for sure. I have to wonder how they can't realize what public relations harm they are doing to themselves, and why they continue to do it anyway. It's not like TLC tells them what to answer too. The questions are aways the same, but you're free to answer what you want. To see John David repeating "keep watching", ad if he can't live his life without the show is so depressing and it's totally on him. I miss 19 kids. It was real and not so scripted. I liked Michelle and Jim Bob narrating. Sorry don't mean to sound negative, but this show is just not the same. Bring 19 kids back....all of the Duggars. I really hope he finds someone soon. He seems like such a catch. I hope he learned from the mistakes his older brother made. He's is my favorite on the entire show. Great guy. I wish him the best. I agree. He seems like a solid guy with his head screwed on right, never got that vinr from Josh, unfortunately, though I pray for him often. I get the feeling from him that he would treat a wife like his princess. I never got that from Josh. Seemed like he was more into himself. I find it interesting the really nice partners that the single Duggars and Bates met and mated so far. Oh my goodness that was painful to watch. He kept looking at his brothers and saying "I don't know". That's not a man ready for the full responsibility of marriage and family. It feels as if he knows it will be good for TV ratings, but he just "doesn't know". How about there's a man who doesn't need the spotlight? He's never been one to ham it up for the cameras. I just love John David. He could care less about the cameras. He is truly waiting on the right one. I respect that about him. John David is a fine young man and any young lady would be so fortunate to call him his spouse. God Bless You and just trust in Jesus Christ and he will see you thru. God Bless you Duggars! My family and I fully support and pray for you! We love your show, and will never stop loving it! Stay strong! I totally agree! Come on! Put a tank top under that or pin it up an inch!!! No one was saying "Nike!" I agree. She's very pretty! Hopefully she doesn't feel like she needs to show that much. Absolutely, I agree too! The interviewer's top is a little too revealing. Being aware of the comfort level of the people you're interviewing is just good manners. She's dressed fine, in a very ordinary way. Cleavage is in bad taste anymore. She should have covered up out of respect. You do that when visiting foreign countries, when visiting churches, etc. I don't know where those poor boys had to keep their eyes during that interview. At each other & their shoes, probably. I missed the show :(. Who's cleavage? It seems like an affront but that is the point I guess. John David has such a sweet and pure heart. I pray he finds the lady God has in mind for him and that she appreciates his genuine love of the Lord. It is so hard these days to find a pure hearted man let alone one who has such a great foundation in his love for God. It looked liked a very uncomfortable interview and I blame the Interviewer (flirty cleavage girl), I think he kept looking to his brothers for one of them to jump in and help. No more interviews by her please! Then don't do the interview if you are offended by the clothing. Otherwise, be a grown up and do the interview. Simple. I like him and jana among duggars. Awkward interview. You can tell JD is uncomfortable with the questions. Why do the Duggars stay on tv if they are constantly uncomfortable with how people see them? What a solid, stable, mature young man. He seems like he knows what he's doing, he's working hard and waiting on Gods timing and provision for the next season. I think it's worth mentioning that we do not know the impact his older brother's choices have had on John-David. I assume it was incredibly devastating for him and he's probably done a lot of soul searching and because of that I actually take John-David more seriously and respect him more. In contrast to interviews in previous years, he just seems so much more humble, grounded and emotionally present than ever. I do not understand why this interview acceptable when there is a woman who is revealing herself(cleavage)! This goes against everything they stand for (remember Nike? ), but yet it is published for Christians and children all over this world to see on their blog. This is so wrong! I honestly could not believe my eyes. To ultra conservatives how is this acceptable? Because they are getting paid and the hostess is from TLC?? So so wrong! Revealing herself? I find this expression highly exaggerated . I guess John fumbling around in interviews never finding the right words is preferable to Josh who had a smug know-it-all answer to everything.